For other uses, see Solanum (disambiguation). Solanum is a large and diverse genus of flowering plants, which include three food crops of high economic importance, the potato, the tomato and the eggplant. It also contains the nightshades and horse nettles, as well as numerous plants cultivated for their ornamental flowers and fruit. Solanum species show a wide range of growing habits, such as annual and perennials, vines, subshrubs, shrubs, and small trees. 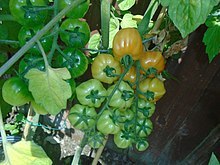 Many formerly independent genera like Lycopersicon (the tomatoes) and Cyphomandra are now included in Solanum as subgenera or sections. Thus, the genus today contains roughly 1,500–2,000 species. The generic name was first used by Pliny the Elder (23–79) for a plant also known as strychnos, most likely S. nigrum. Its derivation is uncertain, possibly stemming from the Latin word sol, meaning "sun", referring to its status as a plant of the sun. Another possibility is that the root was solare, meaning "to soothe", or solamen, meaning "a comfort", which would refer to the soothing effects of the plant upon ingestion. 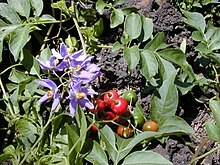 The species most commonly called nightshade in North America and Britain is Solanum dulcamara, also called bittersweet or woody nightshade. Its foliage and egg-shaped red berries are poisonous, the active principle being solanine, which can cause convulsions and death if taken in large doses. The black nightshade (S. nigrum) is also generally considered poisonous, but its fully ripened fruit and foliage are cooked and eaten in some areas. The deadly nightshade (Atropa belladonna) is not in the genus Solanum, but is a member of the family Solanaceae. Potato, S. tuberosum, fourth largest food crop. Other species are significant food crops regionally, such as Ethiopian eggplant and gilo (S. aethiopicum), naranjilla or lulo (S. quitoense), turkey berry (S. torvum), pepino (S. muricatum), the tree tomato or tamarillo (S. betaceum), or the "bush tomatoes" (several Australian species). Solanum species are used as food plants by the larvae of some Lepidoptera species (butterflies and moths) – see list of Lepidoptera that feed on Solanum. The genus was established by Carl Linnaeus in 1753. Its subdivision has always been problematic, but slowly some sort of consensus is being achieved. The following list is a provisional lineup of the genus' traditional subdivisions, together with some notable species. Many of the subgenera and sections might not be valid; they are used here provisionally as the phylogeny of this genus is not fully resolved yet and many species have not been reevaluated. Cladistic analyses of DNA sequence data suggest that the present subdivisions and rankings are largely invalid. Far more subgenera would seem to warrant recognition, with Leptostemonum being the only one that can at present be clearly subdivided into sections. Notably, it includes as a major lineage several members of the traditional sections Cyphomandropsis and the old genus Cyphomandra. Solanum nigrum L. – European black nightshade, "black nightshade"
S. nigrum guineense- "Garden Huckleberry"
Undetermined species of Lycianthes have been referred to under names such as S. chrysophyllum, S. ciliatum Blume ex Miq., S. corniculatum Hiern, S. lanuginosum, S. loxense, S. mucronatum, S. retrofractum var. acuminatum, S. violaceum Blume, S. violifolium f. typicum, S. virgatum notst β albiflorum, S. uniflorum Lag. or S. uniflorum var. berterianum. ^ a b "Solanum L." Germplasm Resources Information Network. United States Department of Agriculture. 2009-09-01. Retrieved 2013-07-15. ^ Quattrocchi, U. (2000). CRC World Dictionary of Plant Names. 4 R-Z. USA: Taylor and Francis. p. 2058. ISBN 978-0-8493-2678-3. ^ "Purple tomato debuts as 'Indigo Rose' | OSU Extension Service". Extension.oregonstate.edu. Retrieved 2018-06-25. ^ "Vegetable Cultivar Descriptions for North America | Cucurbit Breeding". Cuke.hort.ncsu.edu. Retrieved 2018-06-25. ^ a b "Solanum Phylogeny". Solanaceae Source. Natural History Museum. Retrieved 2009-11-01. ^ Whalen, Michael D (1979). "Allozyme Variation and Evolution in Solanum Section Androceras". Systematic Botany. 4 (3): 203. doi:10.2307/2418419. JSTOR 2418419. ^ Tepe, E. J.; Ridley, G.; Bohs, L. (2012). "A new species of Solanum named for Jeanne Baret, an overlooked contributor to the history of botany" (PDF). PhytoKeys. 2012 (8): 37–47. doi:10.3897/phytokeys.8.2101. PMC 3254248. PMID 22287929. ^ a b Anderson, G. J.; Martine, C. T.; Prohens, J.; Nuez, F. (2006). "Solanum perlongistylum and S. catilliflorum, New Endemic Peruvian Species of Solanum, Section Basarthrum, Are Close Relatives of the Domesticated Pepino, S. muricatum". Novon: A Journal for Botanical Nomenclature. 16 (2): 161–167. doi:10.3417/1055-3177(2006)16[161:SPASCN]2.0.CO;2. ISSN 1055-3177. ^ Ochoa, C. M. (2006). "Solanum tergosericeum (Solanaceae sect. Basarthrum): A new species from Peru" (PDF). Phytologia. 88 (2): 212–215. Dressler, S.; Schmidt, M. & Zizka, G. (2014). "Solanum". African plants – a Photo Guide. Frankfurt/Main: Forschungsinstitut Senckenberg.